An art battle commences. Those with artistic interest should participate! 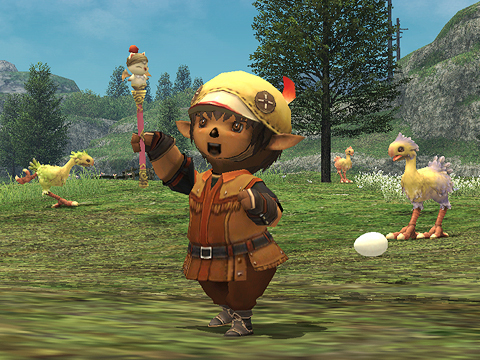 FINAL FANTASY XI is set to enter its eighth year of service on May 16th, and what better way to celebrate the occasion than with the latest installment of the ever-popular Fan Art Contest? Be it a scene from one of your most memorable adventures, a montage of your travels throughout the years, or a joyous anniversary celebration among fast friends, we welcome any and all submissions paying tribute to the 8th Vana'versary theme! All entries will be judged by an all-star panel consisting of development, operations, community and localization team members who will review the artwork and select the prize-winning masterpieces. The winning pieces will be featured here in the Topics section after the contest has drawn to a close, and their artists will be rewarded with a very special prize—the Nomad Moogle Rod in-game item! What's more, as a special 8th Anniversary bonus, the Crystal and Mythril Prize awardees will also receive a Chocobo Beret, the in-game item presented to attendees of VanaFest 2010 in Tokyo. Best of luck to all entrants, and we look forward to seeing your inspired works! - Contestants must possess an active FINAL FANTASY XI account. - All contestants must agree to the defined terms and conditions. * Contestants under the age of 18 must obtain the permission of a legal guardian before submitting entries. Submission period: Sunday, May 16, 2010 until Wednesday, June 16, 2010 at 7:59 a.m.(PDT). How to Submit Your Art: Submissions may be sent via email. The body of the mail should contain all of the required information listed below, with the illustration attached (see below for file format/size information). Emails should be sent to the following address. - Your PlayOnline email address. - Your FINAL FANTASY XI World name, as well as your character's name. *Should your illustration be chosen for display, the above nickname (and your real name, if submitted), artwork title, and personal comment will appear along with your artwork. *Entries that do not fulfill the above size requirements may be excluded from judging. As a general guideline, files should conform to either the 4:3 or 3:4 aspect ratio. * Illustrations must be original pieces of art. * Please attach only one illustration per email. Contestants will be limited to only one submission. * Contestants will not be notified directly of the contest results. Winners will be announced publicly in a Topics posting. * For sculpted artwork, please take a photograph and submit it via e-mail. To avoid any complications concerning submissions, please read the following terms thoroughly. We ask that all contestants understand and agree to these terms prior to submitting their artwork. Square Enix will regard all submissions to the Fan Art Contest as implicit acceptance to these terms, without exception. Winning contestants may not transfer their claim to a prize to another individual/character. The personal information accompanying contest entries will be utilized in sending prizes to contest winners. In all regards, personal information will be handled with the utmost security in the same manner as laid forth in the guidelines of the PlayOnline User Agreement. - infringements upon copyright/intellectual property, personal credit, privacy, etc. All submitted entries will become the sole property of Square Enix (in accordance with all rights stipulated by International Copyright Law, Articles 21~26, Article 27, and Article 28, together with all rights provisioned by future amendments to said Articles). That taru must really be happy after laying that egg. I always suspected that's how they reproduced.